That the Islamic State (ISIS) has enslaved Yazidi women and children it captured is an established fact; for example, a United Nations report found that "300 [Yazidi] women had been forced into slavery." Now, in its slick multi-language journal, ISIS offers its theological justification for this practice. 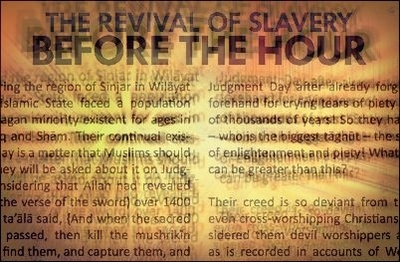 Most of "The Revival of Slavery Before the Hour," a just-published four-page article in the English-language edition of Dabiq, deals with the title topic: how slavery will function as the Day of Judgment approaches. 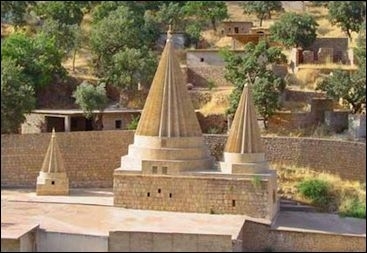 The remainder rationalizes the enslavement of Yazidis, adherents of an ancient religion, numbering fewer than a million, mainly living in the Sinjar region of Iraq and adhering to a pre-Islamic religion that has come under Sufi influences. The anonymous author argues that they are not monotheists but follow a creed "deviant from the truth." Therefore, they do not deserve a protected (dhimmi) status. the Islamic State dealt with this group as the majority of fuqahā' [jurisprudents] have indicated how mushrikīn [polytheists] should be dealt with. In other words, ISIS precisely follows what the premodern Islamic legal tradition agreed upon. Unlike the Jews and Christians, there was no room for jizyah payment. Jizya, a tax paid by non-Muslims to their Muslim overlords in return for "protection," is a privilege reserved to monotheists; Yazidis, not being monotheists, lack that privilege. Also, their women could be enslaved unlike female apostates who the majority of the fuqahā' say cannot be enslaved and can only be given an ultimatum to repent or face the sword. According to Islamic legal experts, Yazidis, not being apostates, may be enslaved. After capture, the Yazidi women and children were then divided according to the Sharī'ah amongst the fighters of the Islamic State who participated in the Sinjar operations, after one fifth of the slaves were transferred to the Islamic State's authority to be divided as khums [the one-fifth of booty that goes to the state]. The Islamic State has thus applied classic Islamic doctrine concerning war booty. This large-scale enslavement of mushrik [polytheist] families is probably the first since the abandonment of this Sharī'ah law. The only other known case – albeit much smaller – is that of the enslavement of Christian women and children in the Philippines and Nigeria by the mujāhidīn there. The above passage refers to the Abu Sayyaf Group in the Philippines and to Boko Haram in Nigeria. The enslaved Yazidi families are now sold by the Islamic State soldiers as the mushrikīn were sold by the [Prophet's] Companions (radiyallāhu 'anhum) [May God be pleased with them] before them. Many well-known rulings are observed, including the prohibition of separating a mother from her young children. ISIS again emphasizes that it goes by the book. Note the verb "sold." Many of the mushrik women and children have willingly accepted Islam and now race to practice it with evident sincerity after their exit from the darkness of shirk [polytheism]. The author then concludes with three hadiths (accounts of Muhammad's sayings or doings) that confirm the utility of slavery to achieve conversions to Islam and win a place in heaven. Thus does enslavement benefit both the Muslim community (by enlarging it) and the individual slave (by making heaven accessible). What a great deal for everyone! The article's heavily Arabized English typifies ISIS discourse, both spoken and written. English provides structure but key vocabulary words are in classical Arabic, with dialect only slightly showing through (e.g., mushrikīn). The transliterations from Arabic are pedantically scholarly, complete with 'ayns (') and macrons (ā, ī). As in every other aspect of life, ISIS unabashedly and brutally applies premodern Islamic law, making no concessions whatsoever to modern mores. It seeks to establish a universal caliphate as though it were again the seventh century. Beheadings and enslavement being among the most shocking Koranic injunctions to a modern sensibility, the group most exults in precisely these and imposes them on those it considers infidels. The wild, reactionary impulses of ISIS appeal to a minuscule number of observers while its messianic zeal has carried it very far, very fast – from the borders of Turkey to the outskirts of Baghdad. But its actions appall the overwhelming majority, Muslim and not, leading to its inevitable collapse and doing irreparable damage to Islam. Mr. Pipes (DanielPipes.org), president of the Middle East Forum, is the author of Slave Soldiers and Islam (Yale, 1981).